Featuring a stunning 15.6″ Widescreen 10-point multi-touch Display, this Acer Aspire V5-571P-6698 brings you a completely new experience. Just use your fingers, simply scroll, flick, pinch and rotate motions, you can open and close programs, browse online, and breeze through photo albums, making a breeze to accomplish your task easily and efficiently. Its frameless edge-to-edge design make it super slim, providing a large area for touch interactions. The worst thing about a laptop is that you have to spend more time searching and less time doing. 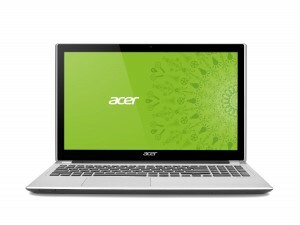 Don’t worry about this Acer Aspire V5-571P-6698. It features Windows 8 which allows you to get instant access to your people, apps, sites and more. This unit combines touch display design with the new Windows 8, ensuring a fast and fluid working environment. Equipped with the 2nd Generation Intel® Core™ i3 Processor, this Acer Aspire V5-571P-6698 allows you to do whatever you want. With stunning visuals and visibly smart performance, you can watch movies, photos, shopping and much more. In addition, you can enjoy the crisp, clear cinematic surround sound thanks to the Dolby® Advanced Audio® v2. Want to type freely in dimly lit areas? No problem with this Acer Aspire V5-571P-6698. It features a Backlit Keyboard to guide your fingers when you have to type in a dark environment. Featuring Acer Instant Connect which will remember previous Wi-Fi spots you’ve visited, this Acer Aspire V5-571P-6698 gets you to the web in 4x faster than conventional notebooks. So you don’t need to wait when they’re in range, it instantly connects you to the Internet. Thanks to AcerCloud, your PCs storage is your Cloud storage, providing wireless access to your photos, music, videos and documents.